Ahhhh my friends. It is like a breath of fresh air to be back to you today. Tomorrow, I will explain all about my absence (unfortunately, it was the most difficult blog post I’ve had to write, to date), but today we will be cheerful and look forward to one of my FAVORITE things – FALL! – and with it, the glorious holiday season that is about to begin. 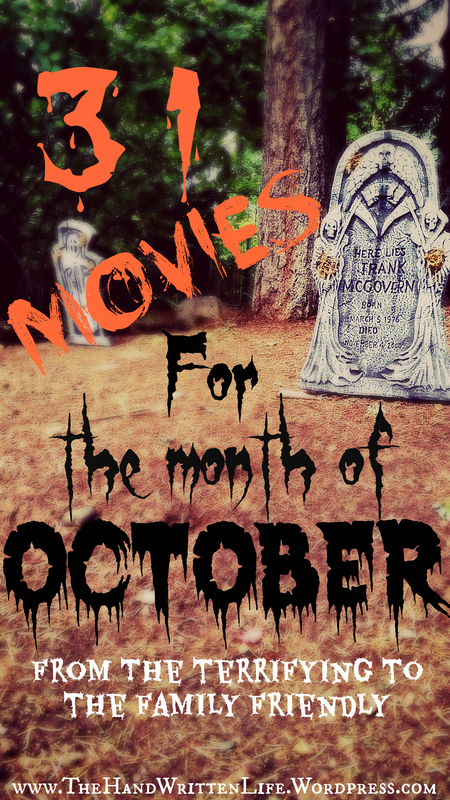 And what better way to start things off than with a Halloween Movie List that’s fun for all ages?? So grab your friends, your family, or your pets, and cuddle up with some popcorn, because I’ve got 31 brand new film suggestions for you to celebrate with! Captain America and I LOVE scary movies, so we’re on the lookout for them all year round. This year has been full of some pretty good ones, some not so great ones, and a couple that were downright terrible! But gathered below are some of our tried-and-true favorites, plus a few exciting new additions. Check ’em out!! A side note for your convenience: Below you’ll find a list of 31 movies – some are appropriate for children, and some are definitely not! For your convenience – films with asterisks by their titles can be found on family-friendly channels such as The Disney Channel, ABC Family, The Hallmark Channel etc. Parental discretion is advised, as they say! The ones in italics are the ones I’ve been particularly looking forward to this year! Clicking the links below should either take you to the Amazon Instant Video version when available, or an IMDB description of the film. To watch or rent any of the movies on this list and more (including those on last year’s list) – check out my Amazon Affiliate Halloween Themed A-Store! This post contains Amazon Affiliate links, which means I receive compensation if you make a purchase using one of these links. Just another way to share my favorite items with you while supporting this bloggy habit! Do you have any favorite movies that are appropriate for the month of October, or that are Halloween themed (scary, mysterious, etc)? Share them with us in the comments and maybe your suggestion will appear on next year’s list! Enjoyed these movies? Be sure to see last years suggestions! And don’t forget to follow me on Pinterest for even more Halloween crafts, ideas, and inspiration! ← 7 Quotes For A Happy Mother’s Day! Yes, me too! I am looking forward to their Christmas countdown.